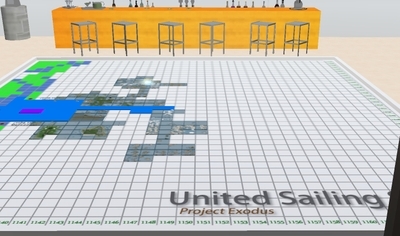 Project Exodus (no it is not Charlton Heston does Second Life)- this project has been purportedly on the drawing boards of Linden Labs for over 6 months, prior to the new Land Pricing Policy. The plan was to enhance the experience of the SL residents and to offer new areas of exploration as well as things to do. One of these new activities being sailing and to update first entry into Second Life for new subscribers. Concurrent with this project LL had been building up their main land and offering substantially reduced rates compared to private estates. Mainland Full Sim Tier $195 USA compared to Estate Full Sim of $295 per month as well as costs to terraform, build and have the land delivered. The new rate plans were rolled out during the 4th Quarter of 2008 by Linden Lab. In effect this killed off open sims as used , and allowed step conversions to Homestead or Open Sims to Full Sims no charge. These new rates for private estates were the coup de grae for many private estate holders. Sarah Nerd, long time land broker, got out of the land business. Estates have been pulling out as fast as you can hit delete. The deluge is not over yet. January tiers starting to come due and the exit rate is expected by many observers to climb. This was first wide spread mention of the new ocean, http://blog.secondlife.com/2008/12/19/hoist-the-mainsail-and-head-for-the-high-seas/. Found the main blog for SL on December 19th. The new region via the new ocean will connect to the Sailing Sims. In essence offers passage from estates to mainland. They still will pay for their land as they have and make decisions on allocation of water versus land on their sim. In addition to no charge to move all of their sims they have new water to sail. It would be a good guess this land will become more valuable. 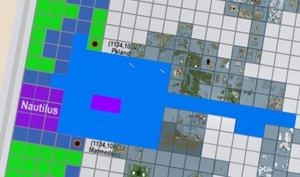 The Sailing Sims is a "loose confederation" of water based estates and sims that have interconnected waterways. Consisting of about 120-130 sims. A map of their current lay out can be found here and they have a number of blogs and intersim races and events. The timing of this seemed very peculiar, perhaps just a coincidence. LL builds up their grid, financing expansion on new land sales. They somehow did not factor in that people would push the technology envelope to the limit and use the Open Sims full tilt. Yet, this same organization was able to plan a six month launch to move 120 sims, and build an ocean. This seems to be incredulous that we are to believe that they had no inkling of Open Sims usage and had to discontinue this product. It seems paramount to a greedy grid grab. I lost an Open Sim and now we are our finding our estate at a cross roads, like many others, I was upset. I had joined SOS to help mobilize efforts to save our water. SOS members were urged to contact the Attorney General of California. To me and many others it seemed like Nautilus and other Main Land had been conveniently built up and funded by the 100's of Open Sims that were launched. The rewriting of rules of use freed up quite a bit of grid space. Many mobilization events happened, including events at the Sailing Sims over in Hollywood. The Sailing Sector has not been that vocal in the SOS group as of late. The efforts of the SOS group appear to be ineffective or shrouded in secrecy. They have been contacted for a comment. . .
"I still feel strongly about the OS pricing policy that LL has adopted. I feel that a 67% increase is wrong and have told the LL that on more than one occasion in my discussions with them. I have proposed alternate suggestions on the OS lite product and alternate pricing. Unfortunately they didn't bite." "The most common comment about the Blake Sea Project runs like this: LL is playing favorites in selecting the USS for special treatment. The problem with this statement is that it has a faulty premise. The premise above is based on assuming LL or Jack is your father and you all and the USS are his children. " "The proper premise is that LL is a business that looks for the best tools and partners to accomplish a given task. If LL looks at three service providers and after doing due diligence picks the Blue Company over the Green Company or the Red company they are making a decision on how to best get a job done. A journalist for the business pages of the local paper would not say that LL was showing favoritism, he would say, LL picked the Blue Company as the best partner to work with them on project X." "Do you think LL has spent the hours and dollars they have in creating the Blake Sea only to do a favor to USS? On the contrary, LL has finally figured out that they are not good community builders, they need partners to do that. They have learned along with all the Corporations the have build ghost towns in SL that it takes a community to bring life to the pixels. They get it now." The above quotations from Marktwain were from correspondence we had via note cards. It is appreciated that he offered an update on the Exodus Project. My email to the Attorney General of California generated a thanks for the information form letter. I do not know what the tipping point is to move LL to action. Another idea is to see what can we do as another sailing community to move LL to work with us. Can we move forward as a "community of common interest" to meet our own needs. It is time a parley of the Brethren meet to work together. I find this article incoherent. It misleadingly suggests there are “new” rates on the mainland, but the $195 tier rate has been in place for years, and rightly so, as mainland has less features than private islands, and less land controls for the owner. “If LL looks at three service providers and after doing due diligence picks the Blue Company over the Green Company or the Red company they are making a decision on how to best get a job done. A journalist for the business pages of the local paper would not say that LL was showing favoritism, he would say, LL picked the Blue Company as the best partner to work with them on project X.”"
No, no, and no. In the Real World, companies don’t chose their partners with such haste, after first attempting to co-opt others, and with such curious love/hate bargaining, driven by panic, and they in fact actually really look at three prospective partners, or six, or whatever, and more often than not, they publish an open bid or request for proposals. Linden Lab has done none of that. There is absolutely nothing to suggest that in fact they studied all these possible projects and partners, or looked at the vast landscape of opensim victims, which included educators, artists, non-profit communities, etc. as well as sailors, and made any kind of coherent choice. For example, there are educational or art projects they could have blessed with their largesse of moving them to the mainland or giving them some sort of cut rate or freebie or FICation — they didn’t. Sure, the Lindens had a craven want here: to sell their Nautilus sims, which sold, but which then didn’t fill up and become “energized” quite as much as they’d like (a lot of it is still for sale by land barons who can hold the double-prim 1024 m2 parcels, i.e. 1024 tier of $5 instead of 2048 tier at $15, or pro-rated for larger sim owners, probably until the end of time, because all they need are a very few sales to make up their investment on the auction). In the real world, you wouldn’t find a normal mature business scurrying hurriedly to first sidestep an existing big community and deal with others (remember that part of the story) as a way to sort of muscle the original community, then double back and give the larger community an offer it couldn’t refuse. Oh, you would, in the real world, if you were dealing with, oh, say, the Russian mafia in Brighton Beach and gasoline station dealerships. Seriously, people who constantly play the “real life card” as an explanation for Linden Lab’s atrocious favouritism practices have never been in real real life, or if they have, it’s only in other cut-throat Silicon Valley tekkie start-ups where perhaps these practices are encouraged. They aren’t in the rest of normal America, seriously. It’s immature to claim otherwise. If Linden Lab has had some sort of “epiphany” that they are no different than any other corporation that “can only build ghost towns” (rather an unsupported thesis, quite frankly), then, we’re not seeing that they are going about this in any kind of conscious and planned way. They could easily advertise on their forums for bids for such partnerships, and regularize them and multiple them effectively if that’s what they want. The problem is the Lindens have been of two minds and argue about this among themselves. Some of them like to pretend they are just a platform and only involved in Lab Science making software, and the hell with all the life forms that emerge in the petri dish, study them, delete them, who cares. Software uber alles. Others are more conscious that they need to sell land that has happy people staying on it who keep happily paying tier, and that means caring a bit more about content and community. But then those types lurch around like the funmeisters who drive you nuts on a Club Med vacation with clipboards in their hands, trying to get you to sign up for the bunny-hop and snorkelling lessons when you just want to lie on the beach. There idea of community tends toward the anodyne and PG and vapid building-for-building’s sake without respect for the amateur and his pace, or without respect for the professional who simply just needs the Lab to get out of the way. It’s painful to watch. Remember Boardman? Such a big project, Jack’s first big push to beautify a sim and get a community of crack builders and designers to move in and make it a sort of consciously kitsch suburbia — and it worked for a time until they ran out of prims. Then those people like Barnesworth or Ingrid moved to these other sims — Demos and surrounding sims. They built a beautiful seaside community with activities and shopping but then Jack stepped on it by making the absolutely wacky decision to pull up to its seaside a new set of sims, which obliterated the “waterfront” which was really just void front. Plus, they could never deal with the lag. So that whole crowd sold their sims for a huge price and moved to their own private islands, Tableau, etc. Of course, it’s always been a challenge for anyone struggling to make a full sim or contiguous sim area in SL on the mainland because one spoiler, not to mention all the ad farm extortionists, can utterly ruin it for you and make all your time and money go to waste. Yet the Lindens can’t seem to devise a policy to enable small parcels on sims like that to go to the community most vested when they become available, because they don’t wish to play favourites (it’s always when the Lindens very sporadically and haphazardly suddenly decide to stop playing favourites, against the backdrop of their always doing that, that they do their worst damage). So unscrupulous barons, knowing there is a group desperate for prims and view, grab the outlying parcels and extort with them. I’ve seen sim after sim blighted and ruined in this way, especially in the old world area — and even with ad farms on the run now, extortion is still a problem. Perhaps there’s a fair way to devise bidding systems that let majority land owners on a sim — or even just *any* land owner on a sim — have first dibs when a land is abandoned or put to sale. That would relieve a lot of the uglies that people suffer. With no new full sims coming on the mainland auction since last July, the pressure for small time barons to grab reauctioned parcels abandoned on older sims is much greater, and so they do, to much havoc. But it’s a free market — free, except, it isn’t really, as any market in which such extortion takes place is a market with some kind of artifically-induced socialist scarcity somewhere in the mix — and here, it’s the Lindens’ authoritarian unwillingness to exercise good governance and zoning rules that sets the stage for these practices. Correction: The rate plan just described was rolled out in 2006 with the introduction of class 5 servers. Of course, pointing that out would deflate the idea that it was part of a conspiracy hatched during the last six months to cause an “exodus”, so, bonus points for making an “error” to support your conspiracy theory. For the record, I do believe you’re talking about OpenSpace Sims, not OpenSim as in the OpenSimulator – open source SL server. Anywho, I’m glad you brought this up! Quite a while ago when all this OpenSpace nonsense started I decided to spend some time and explore the Nautilus regions and the surrounding sims. Oddly enough, while poking around over there I had found quite a few full prim sims – brand new mind you – that were nothing but water. Empty voids. I remember thinking at the time what a waste! To spend one full server on just an empty sim. Now I realize what they were doing. Check out Muta on the map for an example of what I mean. Gee, Disappointed, don’t forget SOS’s stellar fundraising effort, an “IPO” on Ancapistan. So far it’s taken in just under 400,000 Linden, so I’m sure that money will be put to good use.